Buy Hilton Gold status for just $49 ! Here is an interesting offer if you are interested in getting Hilton HHonors Gold status. Hilton is currently offering a free trial of Gold until Christmas in various targetted promotions, but if you didn’t receive those then you can’t take part. In which case, this offer may work instead. Online travel forum Milepoint (a very-much smaller version of Flyertalk) is currently offering Hilton Gold as a benefit if you sign up for their Premium membership package. This costs $49. There are offer benefits included as well (National car rental status, 1000 United Airlines miles) but it is the Hilton Gold card which will attract most attention. The link to the Milepoint subscription page is here (deleted as now dead). Hilton Gold will run until February 2015, so you actually get 16 months of status for your $49. This is a pretty good deal and would pay for itself in just one Hilton stay, assuming two people both got free breakfast. @kipto – It seems to be valid for existing members as far as I can tell. @jb – The status lasts until the end of Q1 2015. I went for it, too good to ignore. Have to say though, I had never heard of Milepoint and since this is obviously intended as a bit of a membership drive I had a quick read through their forums now that I am a “platinum member” (woop woop). Do u think the gold benefits are also applied to the free night I have through the Hilton credit card spent? Thanks for this Raffles, I have used this to get my Girlfriend Gold status prior to a trip to Florida where we are using her points for 4 nights so it has already paid for itself. I’m looking to make use of the Emerald club upgrade but National’s website only accepts US and Canadian licences for the on-line sign up and the UK site makes no mention of how to apply. Does anyone from the UK know how to sign up for the Emerald Club? I did this this morning and they already emailed me my Emerald Club number! Requested the upgrade to Executive on the milepoint site and we shall see what happens. Little confused – I’ve got Gold currently (based on my HHonors Platinum Credit Card, where I spent £10k by mid-2012, so got Gold for the back end of 2012 and all of 2013). Haven’t made £10k yet this year, so this option of ‘just paying’ $49 looks extremely tempting … question is will it affect my current HHonors Points total and/or can I use this route if I currently have Gold? (Apologies for the newbie questions). Yes you should be OK. You can activate the code up to Feb 2014, to run to March 2015. What would happen if I have a booking already made with standard status? Would the gold rulings apply to a previous booking as long as I turn gold before checking in? Often not, you may need to email the hotel to tell them. I once got Gold benefits on a stay which was booked when I was Gold but had dropped to Silver by the day of the stay …. Hopefully I will be awarded Gold before my stay at Heathrow Terminal 5 in a few weeks! In my experience newly acquired status is automatically applied to any existing bookings you may have. I paid $49 for my dad on Saturday 12th October and his Hilton HHonors account turned Gold overnight (17th), which is just in time as they have a stay at a Hilton property on Sunday night. 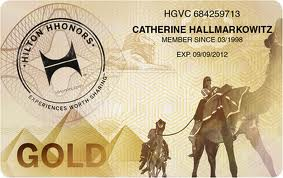 I’m pretty impressed, as it took longer for me to turn gold via the Hilton HHonors platinum Visa card! Another data point – I paid last Saturday (12th) and turned Gold just now (18th). Not bad considering they said 8-12 weeks! And another here – bought 12th/13th and now Gold. But in typical fashion it’s the National status I really want quickly so I can make an Exec Aisle booking! Yes, mine has worked already too! – Time to book! I’m a now a proud Hilton Honors Gold Member! Top work raffles. I really like that hotel – excellent food in the Exec Lounge and great location. Enjoy your trip! I too had about a 4 day turnaround to get Gold status. Quick question as I’m not that familiar with the Hilton rewards programme… I’m staying in the Elara in Vegas for 5 nights next month, but have booked through Lastminute.com as they were about 35% cheaper than Hilton directly. I wasn’t gold at the time and didn’t pay much attention to the rewards etc due to this. So my question is, for about £130 extra, should I cancel my lastminute booking and book directly with Hilton? I can’t see where I find out what I’d earn with HHonors Gold, or what that means in terms of what I could redeem. Any advice? I’ve had 2 failed attempts previously with the $20 trick, but will give it another go. One final question – as I don’t have a physical card, do I just quote my HHonors membership no. to them? Yes, they can type it directly into their system. May be worth a quick email in advance as well.